As climate change has ratcheted up in increments of severity in Vietnam over recent years through storms, flooding, and saline inundation, Vietnam and the US are stepping up their co-operation in environmental protection and response to climate change, a relatively new area of co-operation that has become urgent in order to protect the safety and prosperity of future generations. Thanh Tung reports. Environmental protection, climate change response, and sustainable development have become core concerns of US-Vietnam co-operation policy in recent years. In the wake of heavy losses as a result of extreme weather phenomena, the two nations are boosting co-operation in response to this pressing global challenge. Joakim Parker, mission director of the US Agency for International Development (USAID) in Vietnam underlined the importance of climate change response as enshrined in the US-Vietnam Comprehensive Partnership, which was forged in 2013 as an overarching framework for advancing the bilateral relationship. During a meeting with Vietnam Prime Minister Nguyen Tan Dung, Parker was told that climate change response was one of the sectors with the greatest potential for mutual co-operation. This has been demonstrated at the highest political level. Co-operation on natural disasters is also featured in the US-Vietnam Joint Vision Statement that resulted from Vietnam’s Party General Secretary Nguyen Phu Trong’s bilateral talks with US President Barack Obama in July 2015. Vietnam is highly vulnerable to the adverse impacts of climate change, with more people at risk than almost all other places in the world. From 2013 to October 2015, Vietnam was ravaged by as many as eight tropical storms, with heavy rains and gales impacting the lives of more than two million people. Extreme weather is dangerous to the lives of families and farmers, and the cost of recovering from weather-related emergencies erodes their ability to save and invest in their future. Tremendous achievements in poverty reduction will not be sustained without additional efforts to mitigate the causes of global warming and by helping vulnerable populations in both rural and urban areas to adapt to the adverse impacts of climate change. Experts from the East-West Centre in Honolulu, Hawaii have warned that climate change and global warming have and will seriously affect Vietnam’s agricultural production. Dr Allen Clark, who works at the centre studying the impacts of climate change on Vietnam, said that the country’s greatest challenge was a rise in sea level. “More dangerously, Vietnam has lots of storms and floods every year. The storms will become much stronger due to climate change. 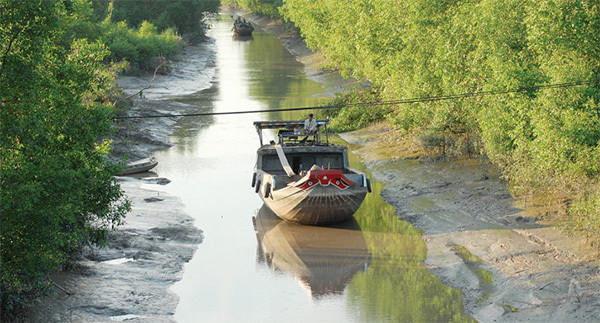 Currently, Vietnam’s coasts are effectively protected by systems of mangrove forests. However, in the future, these forests will be destroyed by stronger storms,” Clark said. Clark used to work in Vietnam, and has a deep understanding of how climate change affects the country. According to him, Ho Chi Minh City, which is just half a metre above the sea level, will be directly affected by flooding. Additionally, as the low-lying Mekong Delta region is Vietnam’s rice granary, the sea level rise will heavily affect the region’s rice production. “Vietnam would need to take into account climate change in its socio-economic development,” Clark suggested. Vietnam’s former Minister of Natural Resources and Environment Nguyen Minh Quang put the sheer scale of the problem into context, noting that if the sea level rise rose by one metre, 39 per cent of the Mekong Delta region’s land and 20 per cent of Ho Chi Minh City would be inundated with water. Parker said that at a global level Vietnam was focused on reducing greenhouse gas emissions, while at a national level it was concentrating on overcoming consequences induced by climate change. During his visit to the Mekong Delta on December 15, 2013, US Secretary of State John Kerry highlighted the co-operative efforts being made by the US and Vietnam to mitigate climate change and address environmental and development issues crucial to maintaining the Mekong as a source of livelihood and sustenance for nearly 70 million people in the region. Kerry announced a commitment of $17 million for USAID’s Vietnam Forests and Deltas Programme, which concentrates on four provinces, including Long An in the Mekong Delta, for the period 2012-2017. “This financial support will help Vietnam protect the environment and seek solutions to respond to climate change. Together, we closely co-operate with each other to prevent environmental degradation. Together, we also develop clean energy sources,” Kerry said. He also highlighted the Lower Mekong Initiative and the Smart Infrastructure for the Mekong Programme, which offer countries the best science available to make informed decisions on infrastructure. In 2009, the United States Geological Survey collaborated with Vietnam’s Can Tho University on the implementation of a climate change response project in the Mekong Delta region. In the same year, and well aware of the imminent threat to the Mekong Delta’s water security, US Secretary of State Hillary Clinton initiated the Lower Mekong Initiative in an effort to foster greater co-operation in environmental protection, healthcare, education, and infrastructure between the US and Thailand, Laos, Cambodia, and Vietnam. During her third visit to Vietnam in 2012, Clinton continued to champion the cause for US co-operation with Vietnam in environmental protection and climate change response. Political will for the project was reaffirmed in October 2014 during the bilateral talks between US Secretary of State John Kerry and Vietnam’s Deputy Prime Minister and Minister of Foreign Affairs Pham Binh Minh. Secretary Kerry noted that the US would continue its co-operation with Vietnam, offering its know-how and experience to help ensure a safe and sustainable water supply in the Mekong river, via the Lower Mekong Initiative, which is currently operating well. Most recently, in late February, the US partnered with Vietnam’s Ministry of Agriculture and Rural Development to organise a two-day climate change symposium. The event was aimed at promoting co-operation in the Red River Delta to mitigate the impacts of climate change, raising awareness about the critical vulnerability of the Red River Delta, and advocating for increased investment to tackle the climate change impacts that this region has been facing. The Red River Delta is a priority for US support. Currently, the active co-operation programmes in the region include the Vietnam Forests and Deltas Programme, the Ha Long Bay-Cat Ba Alliance, the Red River Delta Adaptation and Youth Programme, and US Sister Cities Disaster Preparedness Initiative – all managed through USAID. Specifically, the US and Vietnam have been jointly deploying the Red River Delta Adaptation and Youth (READY) Programme, which will promote effective and innovative climate change adaptation (CCA) initiatives in Vietnam’s Red River Delta. This three-year project, funded by USAID and implemented by the Centre for Marine life Conservation and Community Development, a Vietnamese organisation, will engage with young members of the community to raise awareness and implement practical solutions. In addition, USAID’s co-operation will help district authorities lead CCA initiatives and support the role of civil society in the climate change sector. The project will directly work in four districts of four northern provinces in the Red River Delta: Giao Thuy (in Nam Dinh province), Tien Hai (Thai Binh province), Kim Son (Ninh Binh province) in the Biosphere Reserve, and Cat Hai (Haiphong city) in the Cat Ba Biosphere Reserve. The project is designed to be able to be scaled up to provide similar benefits to communities in other districts, extending the impact and sustainability of the project. For example, according to Bach Ngoc Chien, Deputy Chairman of Nam Dinh People’s Committee, the weather has become unstable over the past few years in the province. The low-lying Nam Dinh province has 72 kilometres of coastline, with many sections inundated by sea water. More than half of the province’s population and 53 per cent of its arable land is in low-lying coastal areas. “As such, Nam Dinh people are particularly vulnerable to climate change,” Chien said. This project has provided consultancy for district-level leaders, enabling them to take the initiative in spearheading community-wide responses to climate change. The US and Vietnam have also been jointly carrying out the Sister Cities Disaster Preparedness Programme which is focused on business resilience. Numerous small- and medium-sized businesses are participating in a three-year initiative that promotes business resilience and public-private co-operation in partnership with the northeastern city of Haiphong. In May 2015, the initiative began a business continuity training programme for ten pre-selected pilot businesses. Upon completing this programme, the business leaders will be better able to protect their organisations from disaster by using actionable business continuity plans. These pilot businesses will serve as models for other Haiphong businesses in preparing for continuity during future disasters. The co-operation programmes on climate change response between Vietnam and the US have greatly contributed to creating a new co-operation framework, which could serve as a model for the international community.